This review first appeared in the December 12, 1984 issue of The Daily Aztec. 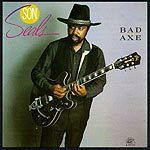 Son Seals plays electric Chicago blues descended from Muddy Waters: guitar-based, straight-ahead. Where women got some mean on their bones. Big enough to keep me warm. To where the fat is at. The song ends with drummer Willie Hayes delivering a slowed-down beat while Sid Wingfield comps on piano and Seals narrates his list of places where these women of quantitative quality can be found  and then explains what he plans on doing once he gets one. Quite an imagination, too! Seals slows down on "Friday Again," almost to the point of a dirge. Hayes and bassist Johnny B. Gayden set a slow, pulsating beat, which serves as backdrop to Seals' skilled solos. His below-baritone vocals are a perfect match for his well-paced and deliberate meanderings on guitar, while Wingfield trades solos with him on organ. "Don't Pick Me for Your Fool" is a traditional blues, and Seals slow, haunting guitar work is backed soulfully by Wingfield on piano, adding to the old-fashioned sound of this number. On "I Can Count on My Blues," Seals reveals a gospel and country influence. Billy Branch adds to that on harmonica. "Cold Blood" is a strong rocker that features some of the best solos from Seals on the album. The energy and intensity on this cut show that Seals can play the full range of blues, from the slow pieces above to the most searing rock 'n' roll.